Isn't it interesting that television series about home, furniture, or car restoration always seem to contain the same plot. Someone desires to restore something to its original or better condition; they encounter challenges; emotions run high; the project takes longer than they planned; then comes the moment when everything miraculously comes together. We can learn a lot about God's work of restoration from these shows and our own personal restoration projects. God's work of restoration is a process. There is a pathway to restoration. 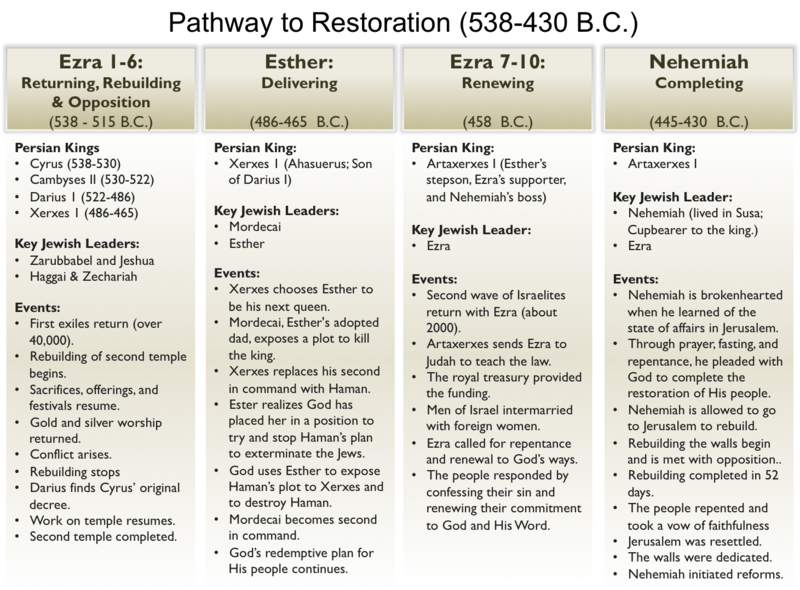 This is the focus of our study this week as we look at an overview of Ezra, Esther, and Nehemiah. The teaching plan this week provides specific helps for combining the two studies from Ezra that were to be studied on December 28 and this Sunday, January 4. Instead of trying to focus on all the biblical content, I have provided a historical picture of the events of the three books, Ezra, Esther, and Nehemiah. This can serve as a prelude to the deeper study of Nehemiah while providing a historical context for Ezra, Esther, and Nehemiah. Warning: There is much more in the book of Ezra than could possibly be covered in this session. If you try to explain every detail of Ezra, especially the meaning of all the offerings, celebrations, and festivals you will probably grow very frustrated. I suggest you focus on helping the group see how God orchestrated history to begin the restoration of His people. We will dive deeper into Nehemiah next week.